Learn more about inclusiveness and accessibility for games like Madden 18. Software Engineer and Accessibility Lead for EA SPORTS, Karen Stevens, and blind gamer Ross Minor, discuss inclusiveness and accessibility for hearing-impaired and visually-impaired players. Hi Karen, can you tell us a bit about your role at EA Tiburon? 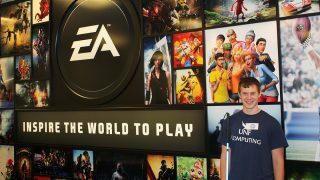 I’m the EA Sports Accessibility Lead, and the first to be in this position. I push for greater inclusion and accessibility. I think of accessibility as the correction of a mismatch between a person and their environment. It’s up to developers to create games that everyone can enjoy, inclusive of individuals with disabilities. Why is accessibility in video game experiences so important? Video games are a very popular form of entertainment, and it’s common for people to play with family and friends. By supporting in-game accessibility, we are not only improving our games overall, we’re changing lives by providing a valuable degree of normalcy. How did you meet Ross Minor? Originally, Ross reached out to me via email about Madden NFL game accessibility. Before becoming blind, he was a fan of the series, and wanted very much to be able to experience it again. I found out that he lived reasonably close to EA Tiburon and asked if he’d like to visit campus and take part in an accessibility awareness event. 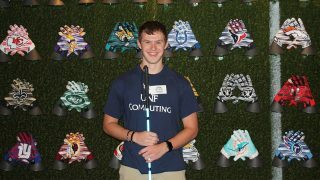 EA Tiburon has recently launched an employee resource group focusing on game accessibility, so it was wonderful to have him as a speaker, representing blind gamers. What did the Dev Team learn during Ross’s Q&A session? They learned how certain elements can be confusing for blind gamers, like menu wrapping. Ross also discussed the use of surround sound for audio cues, as a way of conveying locations, how controller rumbles could be used for events cues, and how sound design makes fighting games playable. For more information on how to better support blind gamers, I recommend watching my publicly available GDC presentation Triple A Gaming While Blind. Did Ross do anything else while at the studio? Ross was given a studio tactile tour of the studio. We have walls of turf, walls of helmets, walls of gloves, walls of basketballs, mannequins wearing uniforms, and many other things of interest for Ross to examine. 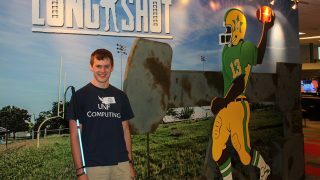 He also got to hear the different acoustics of our recording sound booths and audio team office setups. You can find out more about the studio’s appearance here. Ross also had a chance to play Madden NFL 18’s new “Vision Assists” settings before the patch was released. He was able to get a touch down for the first time since losing his sight. Has the team previously worked with accessibility options to aide players with visual or hearing impairments? Yes. 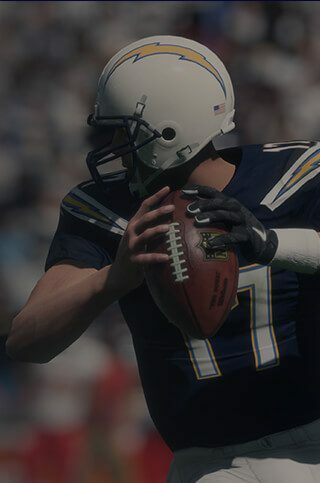 Madden NFL 17 was released with low vision options, which received a lot of positive feedback from our fans. We also tested this option in-house with some of our developers who have vision issues, such as Macular Degeneration, which causes loss of central vision. Madden NFL 17 also shipped with color blind support. We were fortunate that every major type of color blindness was represented by those in the studio, so the feature was very thoroughly tested in-house. For more information on Madden 17’s accessibility features, please read its news blog post. What did it mean to you to be able to open up Tiburon for Ross? 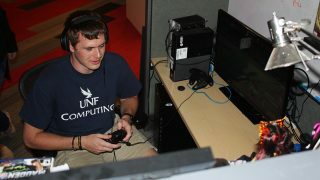 It was great for our game developers to gain a better understanding, of how a wide variety of gamers have different senses. From a development perspective, it’s important we step outside of our comfort zones and support those players. How do programs like this enable EA to “Inspire the World to Play”? I believe everyone should be able to play games. My vision is to bring awareness that gamers of all abilities are included in our audience, and should be considered throughout the development process. What impact did Ross’s visit have on the dev team? Extremely positive and the dev team still talks about it today. I often have employees mention things they learned from his Q&A. Ross, what were your most enjoyable moments when visiting Tiburon? 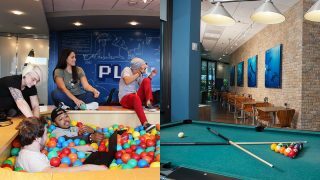 I enjoyed the ball pit in the center of Tiburons conference table and the audio booth, because of how quiet everything was. Most of all, I really appreciated how open the Tiburon staff were to my accessibility ideas and how curious they were - that's a great sign of innovation. What was it like walking into a premiere development studio? It felt like I was in Charlie And The Chocolate Factory! I loved how each floor was themed and how high tech and organized the studio is. What types of things did you discuss during your talk and Q&A session? We talked about different methods of accessibility for blind players, and players with other types of disabilities and what I thought was critical to making video games more inclusive. Were there any questions from the dev team that surprised you? Not off the top of my head, but I was especially pleased to have most of the audience engage in the discussion. I could tell they were taking it seriously. What impact do you feel your Q&A session had on the dev team? I feel like it was an eye opener for many. It's not easy to increase awareness for accessibility enhancements in video games. But now I’ve planted that seed, I hope we can collaborate to push forward accessible gaming. What do you think of Madden 18’s accessibility features? I personally feel like it's a great start, but it's going to take some time to get everyone involved in a video games production, to think with an inclusive mind-set. 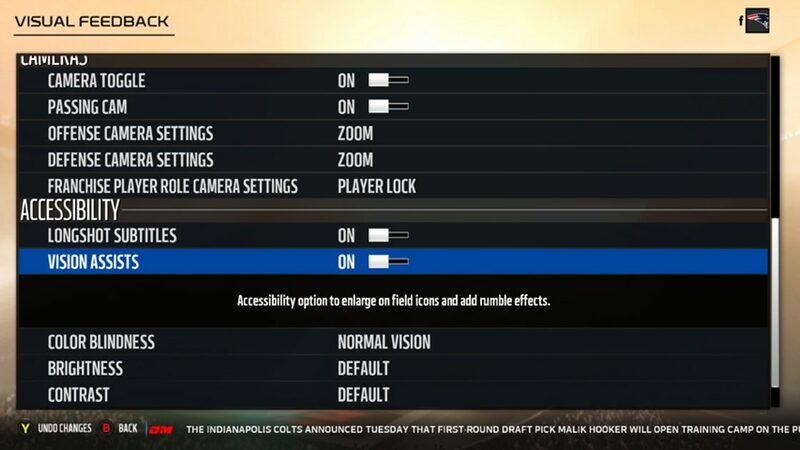 The fact that you already have some accessibility features in Madden, is a great start and shows significant promise for the Madden franchise. Vibrations for kicking and passing are very helpful which opens up new methods for blind people to play the game. The future of accessibility depends on our audience. We encourage filing accessibility related bugs and feedback, to help guide us on potential future improvements. For more information on EA’s accessibility efforts, check out the accessibility portal at ea.com/able, or follow the accessibility effort on twitter @ea_accessible.